Signing Agreements unlocks new Buildings and Units. 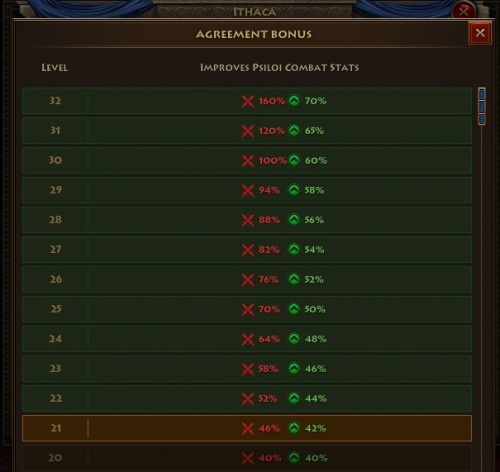 You must build the Ephorate to sign and upgrade Agreements. The Buildings and Units the Agreement will Open. The Numbers of Articles you have and then numbers you still need. Current upgrade level and the maximum upgrade level. To find out the price of signing/updating an Agreement, hover the mouse over the "Sign" or "Update" button respectively, and read the information. 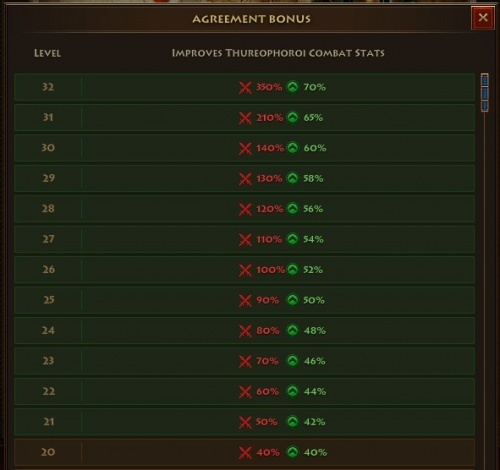 The speed with which you can sign and upgrade Agreements can be increased by upgrading the Ephorate and by using Scrolls in the Academy. There are two places in the Academy to use scrolls and both will improve your signing speed. Signing and upgrading higher tiered Agreements can cost significant resources. Agreements are particularly expensive with regards to Grain so plan accordingly. Maximum increase of speed can be 12% if you upgrade one of 'Singning speed' in Academy, if you have both of them upgraded to lvl20, speed will be increased by 24%. Agreements are acquired in 3 primary methods. The earliest articles are acquired immediately during your development as you complete the tutorial quests. You should use these immediately. GP Articles. 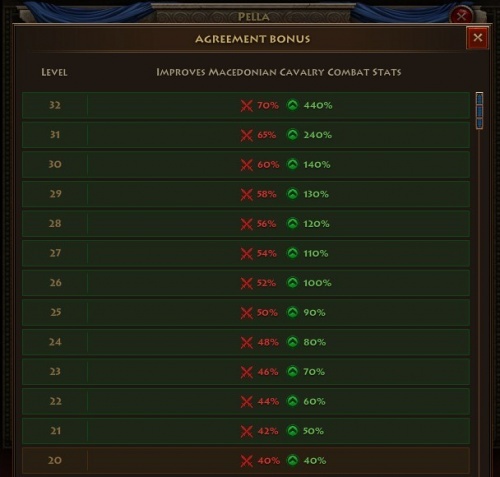 Unlike other Plarium games, Tier III & Tier IV unit Articles must be purchased with GPs via the Market. Additionally you will purchase newer units (such as the Denarii units) with GPs. 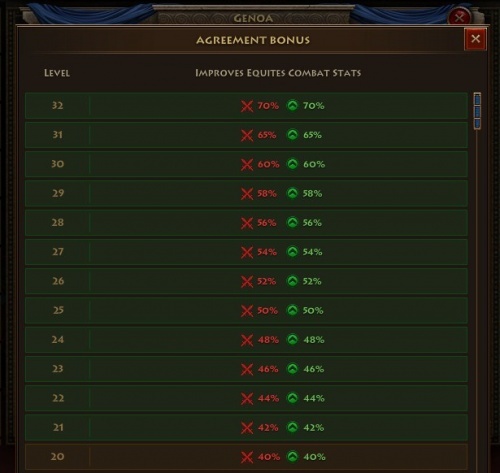 GPs are not purchasable and must be earned through in game actions such as participation in Global Quests. Currently new Agreements require 4-8 Articles each at 25 GPs per Article. It will take a substantial investment of time and effort to unlock all units. See the Resources section of the Wiki for more information. All GP purchases are via the Market. 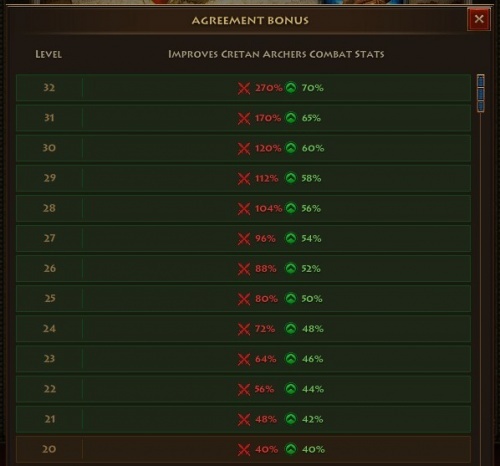 If Players complete all the agreements that do not require GPs to purchase, a 7% passive bonus to the Timber and Bronze production will remain in effect until new agreements are released. 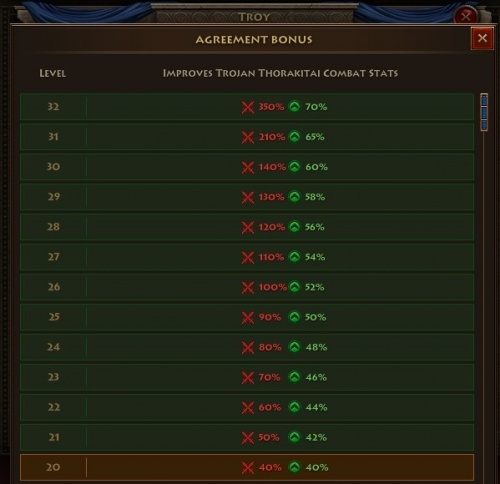 At that time, the bonus will be suspended until the Player negotiates the new Agreements. Iolcos is the first Agreement to be Signed. It unlocks the War Council and is required before anything else can be unlocked. The article can not traded or sold. Chalcis unlocks the Port and allows players to trade resources and articles with other players via Galleys. The port also allows you to monitor Galleys in transit. 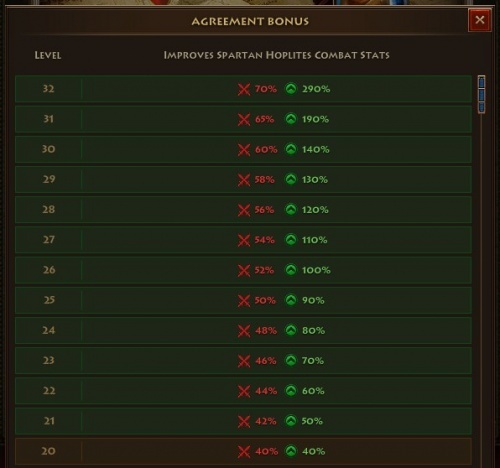 Gravisca Developing your agreement with the Great Etruscan Port of Gravisca, Your defensive units will be able to gather resources from emporia at a faster rate. Samos unlocks the Harbor. The Harbor allows a player to increase the capacity of each of their Galleys which in turn permits the player to transfer more resources in a single trade. Alexandria unlocks the Lighthouse. The Lighthouse allows a player to increase the speed of their Galleys and thus reduce the time a trade takes to complete and for their Galleys to return home. Eleusis unlocks the Temple of Demeter. This building is arguably one of the most sought after buildings early in the game as upgrading it reduces the grain consumption of the Archon's units. Fully upgraded the temple provides a massive reduction to grain consumption allowing an Archon to field significantly more units at one time while still producing grain for development and construction. Hephaestia unlocks the Temple of Hephaestus which provides a boost to Bronze production. Orchomenus unlocks the Temple of Pan which provides a boost to Timber production. Stymphalos Level 1 unlocks level 1 fortification buildings including towers, walls, and gates. 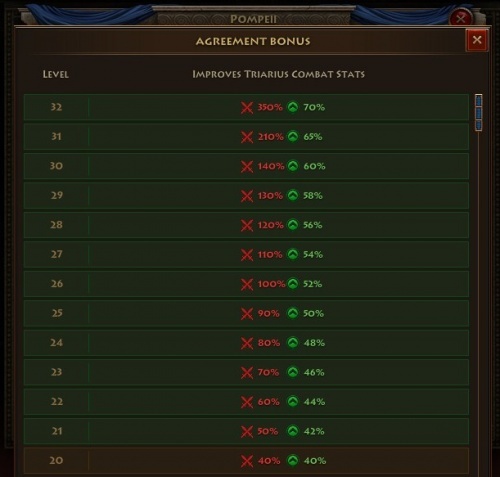 Stymphalos Level 2 unlocks level 2 fortification buildings including towers, walls, and gates. Stymphalos Level 3 unlocks level 3 fortification buildings including towers, walls, and gates. Stymphalos Level 4 unlocks level 4 fortification buildings including towers, walls, and gates. Stymphalos Level 5 unlocks level 5 fortification buildings including towers, walls, and gates. 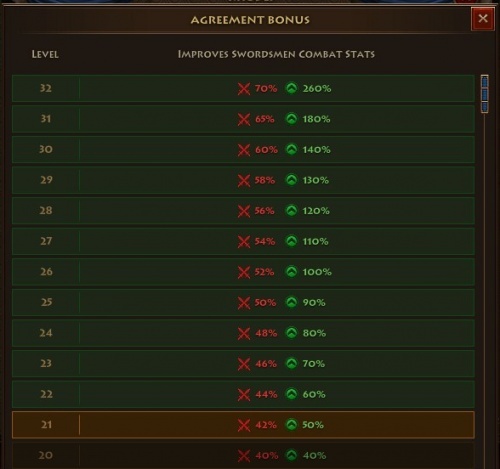 All unit Agreements can be update to level 32. 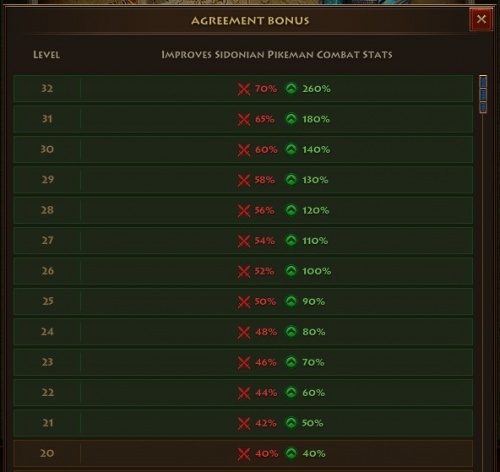 Each update provides a 2% bonus to the offense & defense stats of the unit till lvl20. 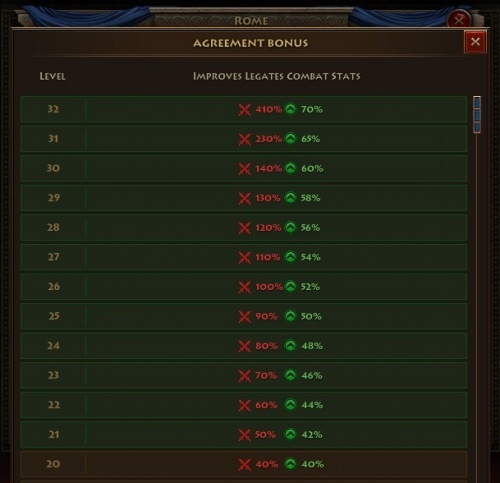 From lvl20 to lvl30 you can upgrade agreements by resources and if you want them on lvl31 & lvl32 you need to use Sketches too. At maximum upgrade units will receive a 38% boost. Note however that Scouts do not receive a boost to scouting ability! Rhodes unlocks the Infantry Camp for training of Light Infantry units. It also allows for the training of Swordsmen, the basic offensive unit. Akanthos unlocks the training of Javelineers the basic defense unit. Ithaca unlocks the training of Psilos, a defense unit specializing vs. other infantry units. Athens unlocks the training of Hoplites. Hoplites are stronger and faster than Swordsmen, but cost more to produce. 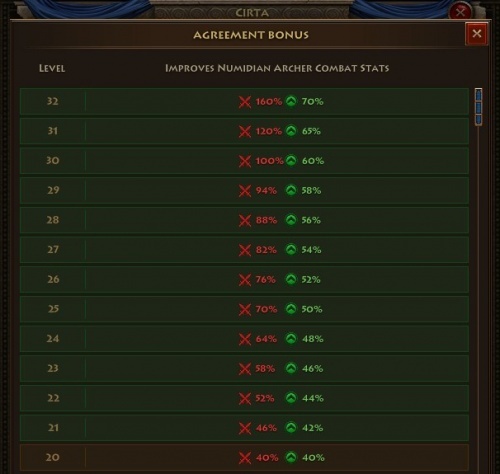 Cirta Signing an agreement with Cirta allows you to hire Numidian Archers. 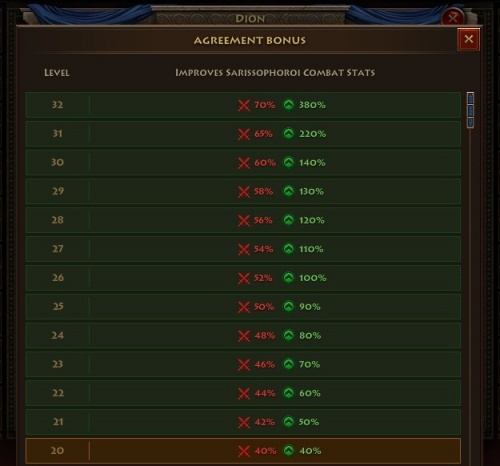 Sidon Signing an agreement with Sidon allows you to hire Sidonian Pikeman. 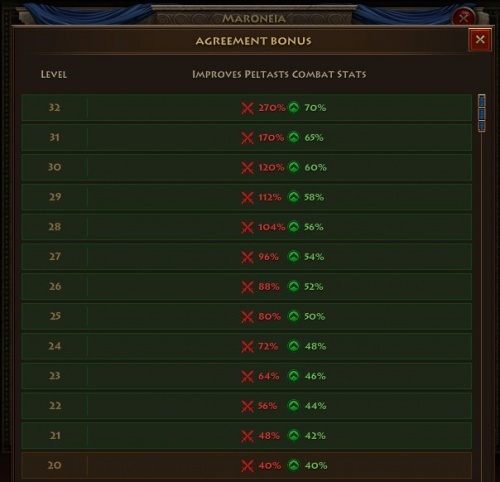 Maroneia unlocks the training of Peltasts. Peltasts are defense units specializing vs Heavy Infantry and Phalanx units. Maroneia also unlocks the Baracks for training Heavy Infantry Units. 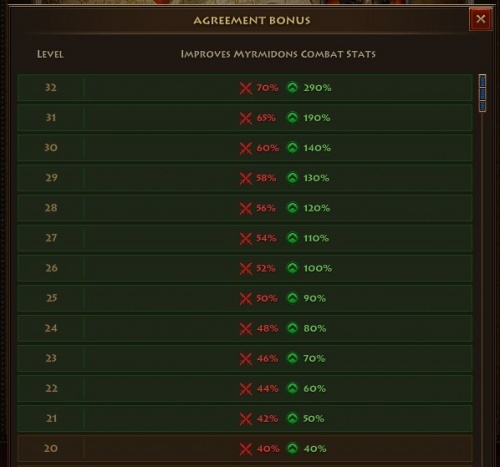 Farsala unlocks the training of Myrmidons. Myrmidons are raiding specialists with exceptional speed. Crete unlocks the Cretan Archer. Cretan Archers are defense units specializing vs Light and Heavy Infantry. Taras unlocks the Spartan Hoplite. Spartan Hoplites are only as fast as Hoplites but are stronger per grain consumption than Myrmidons. 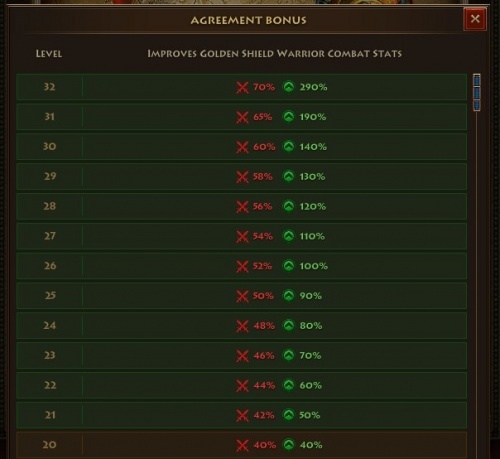 Tyre Signing an agreement with Tyre allows you to hire Golden Shield Warriors. Argos unlocks the Thureophoros. The Thureophoros is a defense unit strong vs Phalanx and Cavalry units. 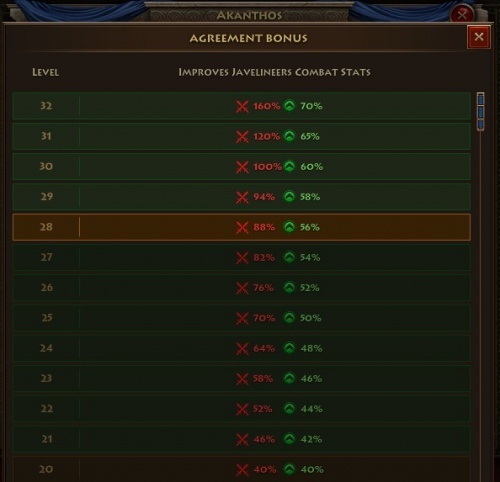 Argos also unlocks the Armory for training Phalanx units. Dion unlocks the Sarissophoros, a decent offense unit traveling at Hoplite speed. Troy unlocks the Trojan Thorakites defense unit. While Thorakites also specialize against Phalanx and Cavalry units, it's stats are more balanced than Thurephoros for handling Infantry Units. 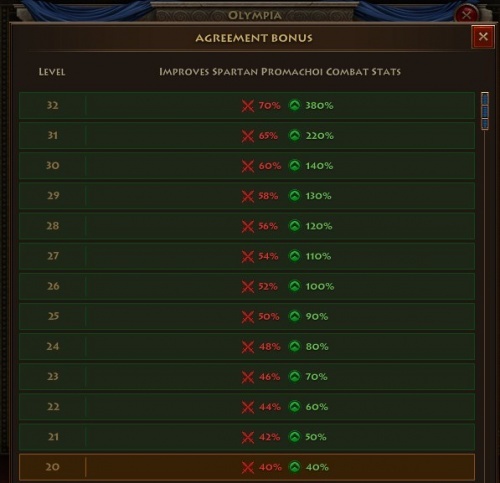 Olympia unlocks the Spartan Promachos, a powerful offense unit that moves at Hoplite speed. 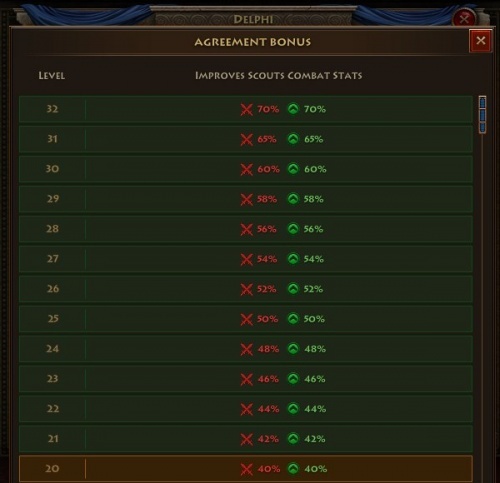 Delphi unlocks Scouts. Scouts are a scouting unit with weak defense stats and no offense capability. It's two purposes are scouting enemy targets and defending against incoming scouts. Delphi also unlocks the Stables for training Cavalry units. This agreement is unlocked very early on compared to other Cavalry agreements. Corinth unlocks the Mounted Peltast. Mounted Peltasts are defensive units comparable to the Thureophoros in that they are also strong vs Phalanx and Cavalry units. They cost more but provide more defense points per unit. 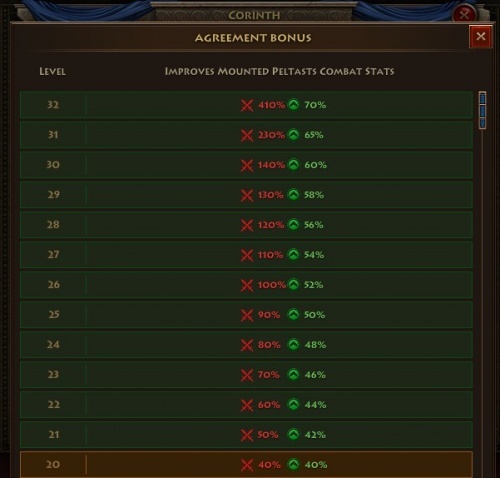 Often it will be an even trade off when deciding which unit to build. Pella unlocks the Macedonian Cavalry. This unit is currently the fastest in the game, making it the best unit for hit and run resource raids. Agema Horsemen are stronger but the speed more than makes up for the loss in power. 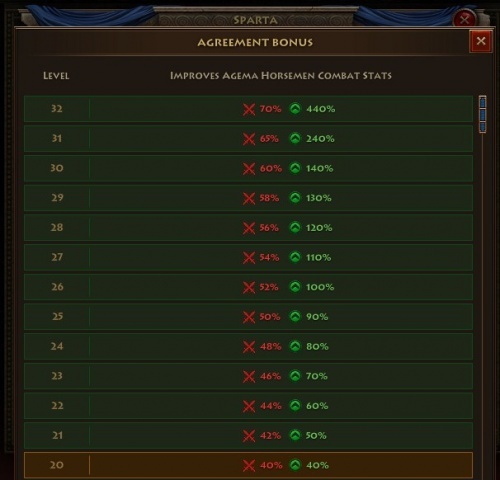 Sparta unlocks the Agema Horesmen. These are currently the most powerful unit in the game. 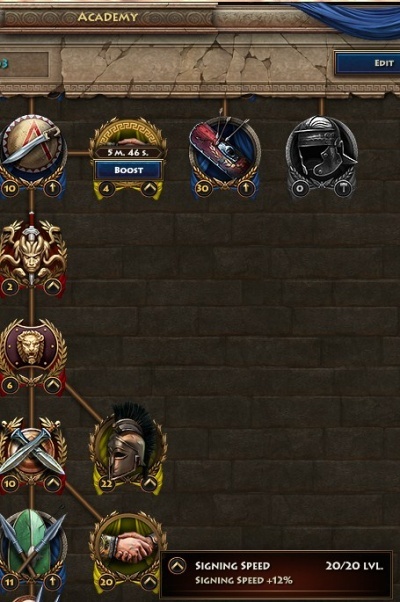 They move as fast as Myrmidons and are currently the final unit in the development tree. 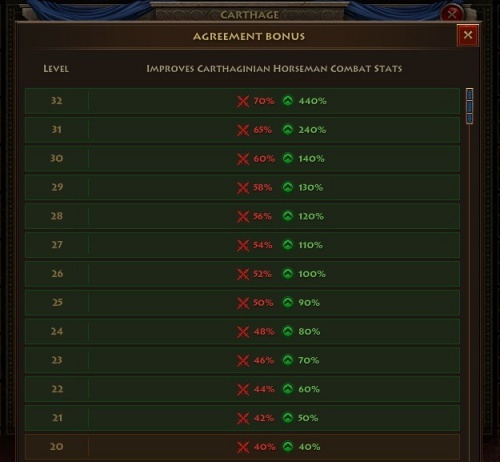 Carthage Signing an agreement with Carthage allows you to hire Carthaginian Horsemen. Capua Signing an agreement with Capua allows you to hire Gladiators. 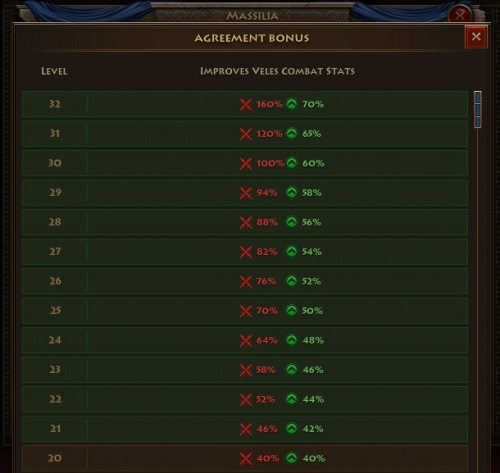 Massilia Signing an agreement with Massilia allows you to hire Velites. Pompeii Signing an agreement with Pompeii allows you to hire Triarii. 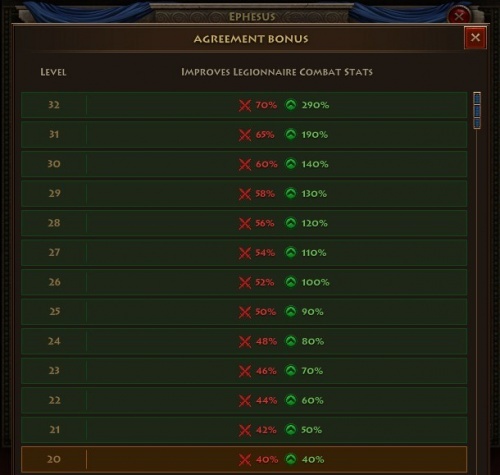 Ephesus Signing an agreement with Ephesus allows you to hire Legionnaires. 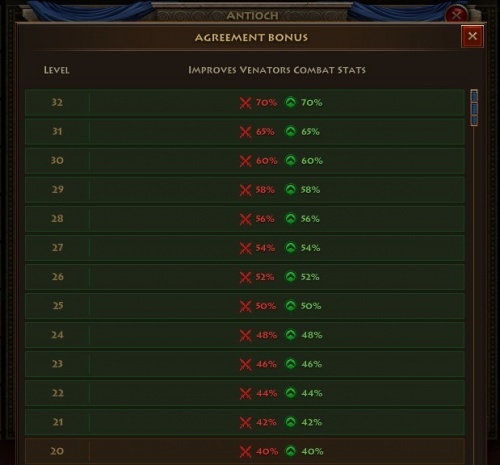 Antioch Signing an agreement with Antioch allows you to hire Venators. Genoa Signing an agreement with Genoa allows you to hire Equites. Cannes Signing an agreement with Cannes allows you to hire Evocati. Rome Signing an agreement with Rome allows you to hire Legates. NOTE: SKETCHES VALUE SHOULD BE RIGHT, BUT RESOURCES VALUE ISN'T THE SAME FOR EVERY PLAYER. This page was last modified on 25 June 2018, at 22:15. This page has been accessed 20,497 times.